Thousands of people marched across major Australian cities Saturday calling for an end to Canberra's offshore detention of asylum-seekers. The government sends anyone who tries to enter the country by sea to camps on Papua New Guinea's Manus Island or on Nauru in the Pacific for processing. [post_ads]Protestors took to the streets to mark the fifth anniversary of the policy's reintroduction, when in 2013 Canberra significantly toughened its stance, signing deals with the Pacific nations and declaring anyone arriving by boat had "no chance" of being settled in Australia. "The policy that was introduced in 2013, to expel people -- the 'Fortress Australia' policy that they (the government) put in place -- that has to go," rally organiser Ian Rintoul from the Refugee Action Coalition told Sydney protestors. "So we fight to close the detention centres on Manus and Nauru, but we fight in that process to bring them here." Hundreds marched through Sydney shouting, "Free, free the refugees", with banners stating, "Five years too long, evacuate Manus and Nauru". Joint rallies were held in Melbourne, Adelaide, Brisbane, Canberra and Perth. Canberra says its policy deters people from embarking on treacherous sea journeys, but rights groups and the United Nations have slammed the wealthy nation for turning its back on vulnerable people, as reports of abuse, suicide and despondency filter out of the camps. "Any country that openly rejects compassion and instead tortures people who we know are innocent, in order to make them a deterrent... has somehow lost its soul," said Father Dave Smith, who recently returned from a visit to the Manus camp. An Iranian man died in a apparent suicide on Nauru in June, with his body arriving in Australia last week after what Rintoul said took much lobbying of a reluctant Australian government, which initially said the man would be buried in Nauru or repatriated to Iran. The deceased man's mother, who requested his body be buried in a place the family could one day visit, remains on Nauru with her younger son but has been refused entry to Australia for the burial, Rintoul added. This was the fifth death on Nauru since Australia's offshore detention ramped up in July 2013, rights groups say, while seven have died on Manus during the same period. 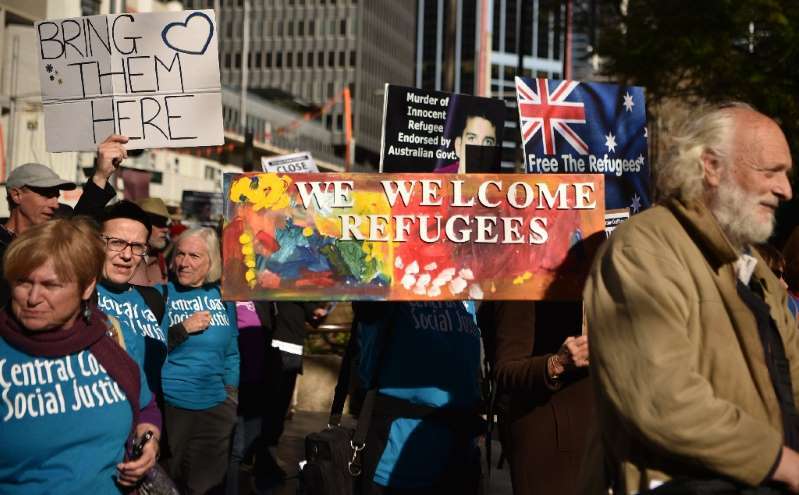 Canberra has tried to resettle those recognised as refugees to third countries such as the US, and more than a hundred have been moved there, according to the Refugee Action Coalition. But they say some 1,600 people remain on Nauru and Manus.